This is one of the most amazing recipes, that you can serve your family, and it only takes about 45 minutes. 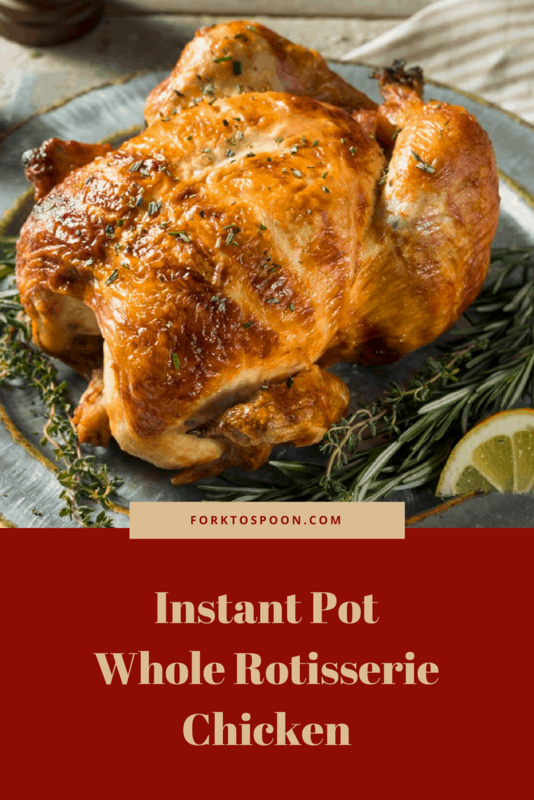 At the end of the 45 minutes, you will then have an amazing, tender, juicy Instant Pot whole rotisserie chicken. It is one of the biggest hit in my house, all of my family, can’t get enough of it. Some people were born with the ability to make and roast chickens in the oven, I’m not so blessed. My chickens used to come out dry, and not very appealing looking. Now, I can literally nail a roast chicken in 45 minutes, and have everyone happy. I used to be one of those moms, that would stop by the grocery store and get a store-bought rotisserie chicken, and be all happy because I would only have to make the sides. But, now, I can keep on whole chicken in my freezer, and literally defrost it in my refrigerator (because I’m all about food safety) and a couple of days later, I nail a complete chicken dinner, for me and my family. And, remember to save the bones, and you can make some amazing chicken bone broth, for use in soups, and the bone broth freezes well, so you can make it and freeze it if you can’t use it right away. I also freeze chicken bone broth in ice cube trays, so I can add and freeze it easily. The browning of the skin, really adds in extra flavors, and the skin tastes awesome. If you want that nice golden color, like I got, remove it from the Instant Pot, and place it on a broiler pan, put a pat of butter on it, with some spices, leave it for about 3-4 minutes until the color is golden. 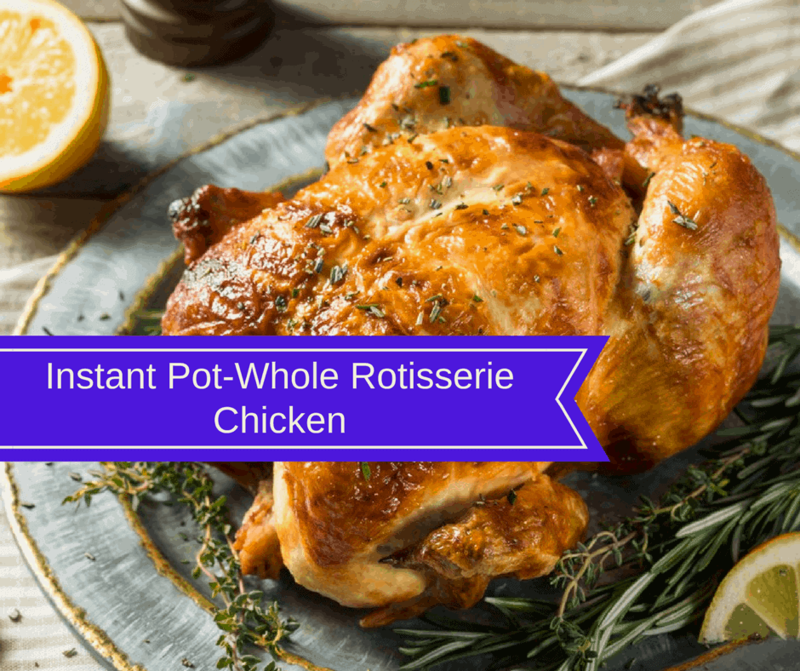 Start by placing the whole chicken in the Instant Pot. 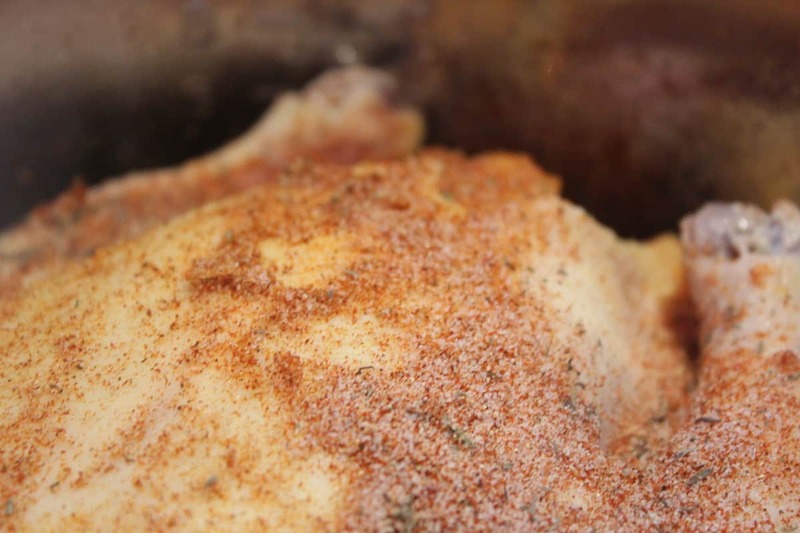 Rub the side that is facing you with the Rotisserie rub, and then you will do the same thing when you flip it. Start by cleaning your chicken, as you would normally do. First, empty the cavity of the chicken. 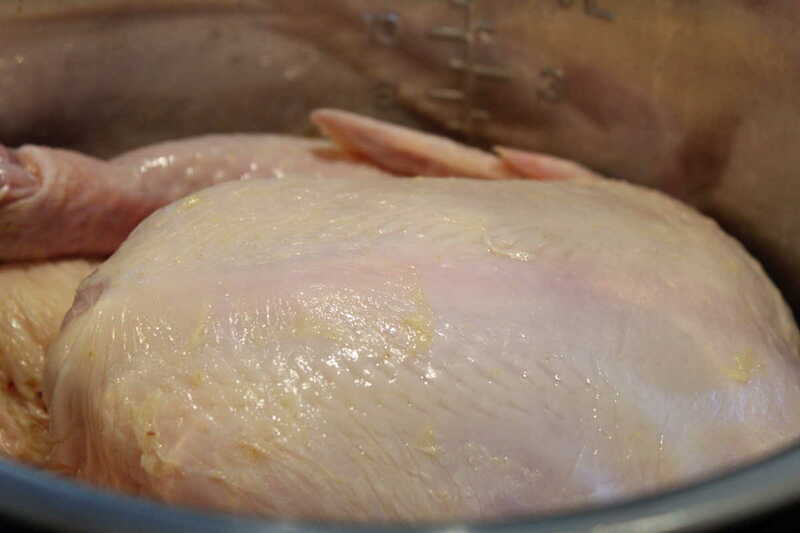 Then rinse the chicken with water, until the water runs clear. Then put the quartered onion and lemon inside the cavity, this will give it a great flavor. In a small mixing bowl, mix together all of the spices. Once, all of the spices are blended well, mix in the oil. This will become your rub. 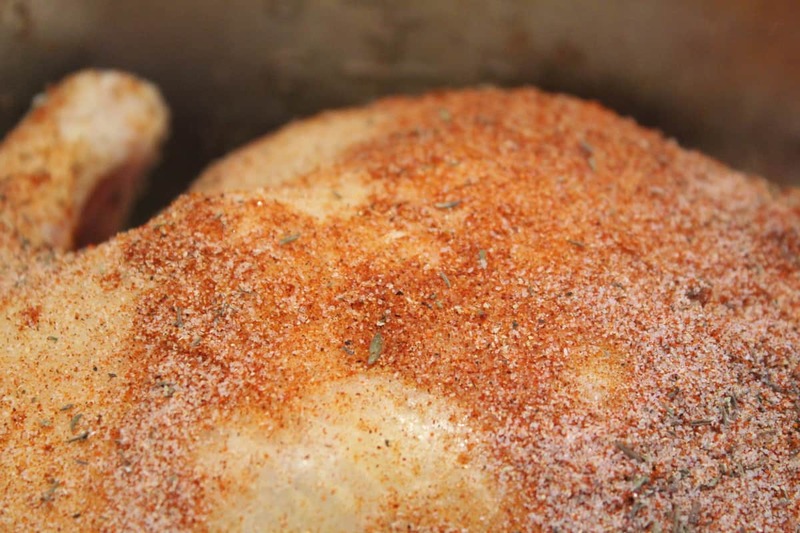 Rub your chicken with the rub, coating the front and back. Then press the saute' button on your Instant Pot, after about 1 minute (give it time to heat up) add the chicken. "Brown" all sides of the chicken, it should take about 3-4 minutes for each side. **Please use tongs, this will prevent burns. And, it will be the most worthwhile tool, you use for whole chickens. 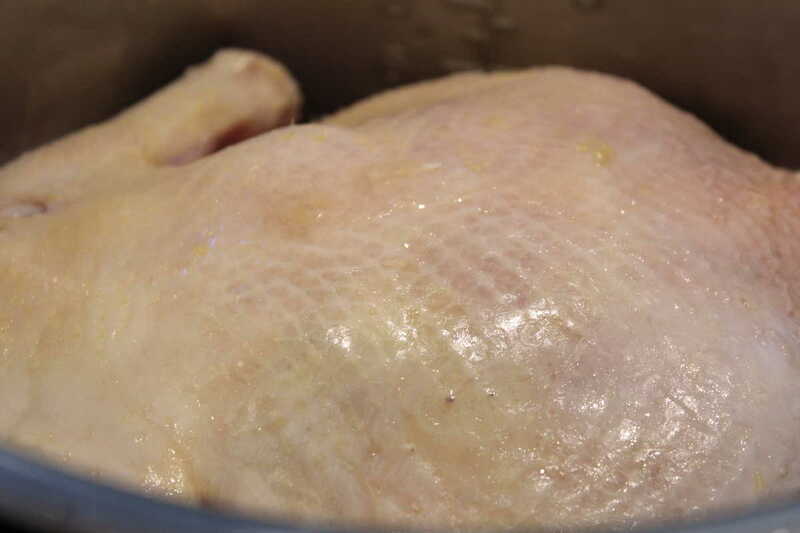 Remove the chicken, once it's browned, and add the trivet, and then add your chicken broth. Then place your chicken on the trivet. Set the Instant Pot, to manual high pressure for 25 minutes, when the timer beeps (mine beeps, when it's done) allow for a natural release. When the lid can safely be removed, remove the chicken, put it on a plate, and it's ready for serving. **Note: You can remove and discard the lemon and onion, before serving if you would like. Note: If you would like a "broiled look chicken" please see my notes in the recipe. 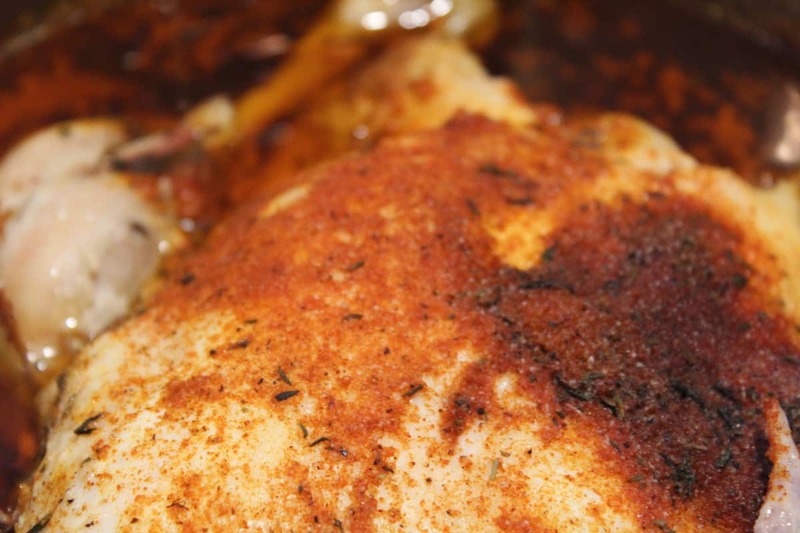 This recipe does really well, if you want to brown it after, in the broiler, just add some butter and herbs. I purchased an 8 qt instant pot. Would like to know if you have any recipes for this size. I really would like to make the above recipe but do not know how to convert from 6 qt to 8 qt.